SOFIA, BULGARIA, October 30, 2018 /EINPresswire.com/ -- Domaine Boyar is the first private wine-producing company in Bulgaria. It was founded in 1991 and started operating in Sofia and in London simultaneously. 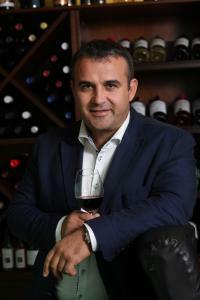 CEO Evgeni Haramliyski proudly points out that the company annually wins about one third of the wine awards for Bulgaria. In 1995, a Domaine Boyar wine of the BLUERIDGE brand entered AC NIELSEN's prestigious ranking of the top 50 best-selling wines in the UK. Haramliyski defines this as one of the most significant successes of Bulgarian wines at the time. Over the years, the company underwent exponential growth, purchased new cellars and built its own ultramodern cellar Sinite Skali (the Blue Rocks) in 1999, which to this day is among the largest ones in Bulgaria. The investment cost more than $ 25 million and the construction project was implemented in partnership with one of the leading banks in the country, Fibank. 75% of the wine samples that the cellar annually sends to the most prestigious world competitions are awarded medals. At the Decanter competition in the UK in 2017, six Domaine Boyar wines won 6 medals which was a 100% success. The company is also among the most innovative ones, as exemplified by its Frutino wines (with added fruit juice), defining a new category in the country’s market. As of this year, the company launched a successful project featuring its own wine brands originating in France, Italy, New Zealand and Chile. Domaine Boyar is also the country’s leading exporter, having strong positions on 4 continents and exporting Bulgarian wines to over 24 countries. After Bulgaria, its largest market is the UK, followed by Belgium. In both countries, the company holds nearly 90% of the sales of Bulgarian wines. One of its goals is to expand its markets to Africa. It also has a project for a joint venture in China, aimed at distribution development and a local office there. "With the support of Fibank, we are able to allocate funds for new equipment every year, which leads to the constant high quality of our wines. We invest in new and modern equipment: the best machinery, special French oak barrels. With their implementation, we constantly update our production facilities, keeping pace with the latest global trends," Haramliyski explains. Haramliyski defines Bulgaria as a wonderful place to live and do business: "We have conditions for growing very good grapes here. I will just mention as an illustration that we are at the same latitude as Bordeaux in France."